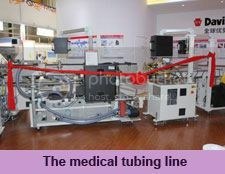 The medical tubing line is compact in design and offers a smaller footprint for clean rooms. It also features a language-specific control system. The line’s co-extruders are engineered to provide processing versatility and value, enabling processors to use materials ranging from polypropylene (PP) to fluorinated ethylene polypropylene (FEP) with a simple feedscrew change, says the firm. It also includes a melt pump for processing thermoplastic polyurethanes (TPUs) and nylons. 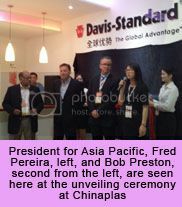 “After the show, the line will be installed at Davis-Standard’s Suzhou facility, providing customers regional research and development access to medical tubing equipment,” added Preston.